Logs dropped upright into a pond do not remain upright, but float "flat" in the water. Explain. 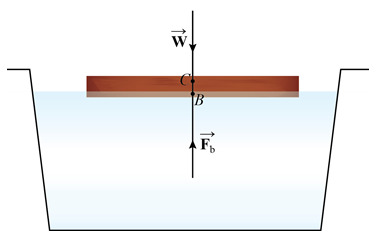 When a log is dropped upright in a water, the buoyant exerted by the water acts on the log at its center of buoyancy (B). The weight (W) of the log acts downward towards the center of gravity (G). In this case, the center of buoyant force (Fb) and its center of gravity do not lie on the same vertical line. Thus, a net torque acts on the log which makes the log unstable. 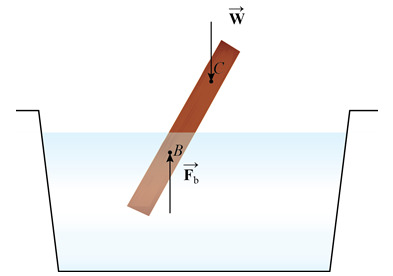 Thus, the log dropped upright in the pond experiences a net torque and experiences an unstable equilibrium. It will tend to remain in the stable equilibrium and achieved by floating flat in the pond. Therefore, logs dropped upright into a pond do not remain upright, but float flat in the water.